Updated: 03/29/19: Updated coupon savings! Flash Sale!!! Look for the codes at the end of this post! If you’re looking for a place to go during your school breaks, Crayola Experience in Easton, PA is the perfect place for some artsy fun! The building is 65,000 square feet and has over 25 different attractions! Crayola Experience Easton will push your imagination to the next level! You can make your own crayon at the Wrap It Up station and have it say your name, nickname, or anything you want! You can paint at Paint Palette, make different things every month at the Activity Studio, dance it up at Cool Moves, watch how crayons are made, and so much more! 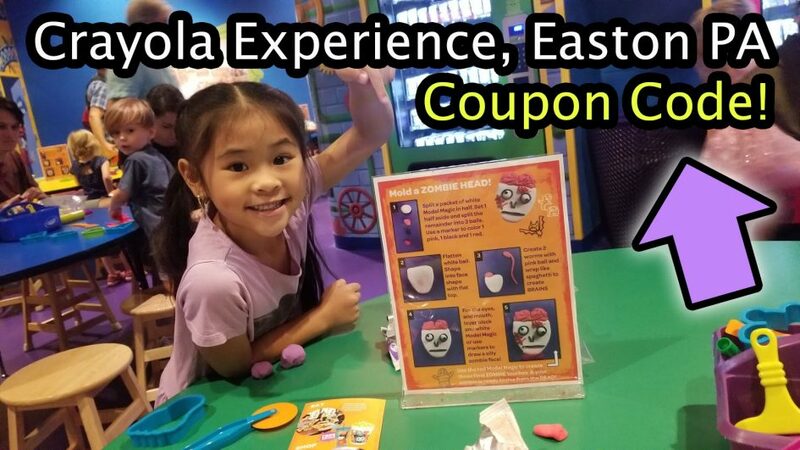 Use my Crayola Experience Easton discount code “DIYwithOllie” at http://tickets.crayolaexperience.com to activate the discount! Be sure to spell it exactly like that (with the capital letters and lowercase letters) for it to work! You can also click this link: http://bit.ly/CrayolaDIY to have the coupon code automatically applied to your Crayola Experience Easton tickets! I hope you have a great time at Crayola Experience Easton! Upload your pictures and tag me on Facebook, Instagram, and/or Twitter @DIYwithOllie. I love to see all of y’all having lots and lots of creative fun! Don’t forget to subscribe to my YouTube Channel: DIYwithOllie (youtube.com/DIYwithOllie) for lots of fun DIYs like crafts and recipes as well as more reviews, travel tours, and vlogs!